There’s nothing like taking laundry from the dryer and enjoying the softness and fresh scent of clean clothes. It’s not necessary to rely on commercial fabric sheets or liquid softeners that you buy at the store. Making your own is easy and environmentally-friendly. Natural alternatives have no strong chemical perfumes, no harmful ingredients, and are worry-free. All-natural fabric softener offers the same softness, is light, and has a scent that is much more inviting. How can you create a DIY natural fabric softener with simple ingredients? It’s easier than you may have thought. You can discover the surprising differences between natural cleaners vs. chemical cleaners. Why Make Your Own Fabric Softener? Some simple ways to clean your clothes naturally are to add essential oil to your washing machine right after your final rinse or during the rinse cycle. To wash blue jeans in your laundry machine, use the gentle washing cycle. Aside from leaving a delightful smell in your load of laundry, an essential oil can also purify the air in your home. Pour essential oil to your HE washer and mix with water. Regardless of the oil you use, you can always use essential oil over commercial fabric softeners. You can now use this liquid fabric softener along with your daily laundry soap. Soap nuts or soap berries are natural plant-based products that can be used to clean and soften fabrics. Its shells are essential for making homemade laundry detergent. These nuts provide Saponin compound that foams during the rinse cycle. To release as much Saponin as possible, use a crusher and mash the berries first. Add the crushed berries to the water and boil for 30 minutes. Cool for a few minutes and strain the solution. You now have your homemade detergent that saves money. Clothes can smell fresh and clean for the longest time with dryer sheets. Homemade dryer sheets can be a great alternative to cancer-causing products such as synthetic fabrics. Cut old fabric into squares. Spray a few drops of scented oil of your choice over them. After your machine’s final rinse, toss your clothes with the sheets until dry. Dryer sheets are great liquid softener alternatives that can last for months. Another option for commercial cleaning products is baking soda. It can make your clothing brighter, whiter, and softer while preventing bacteria at the same time. Pour regular detergent in a pail of water and dissolve it thoroughly. Detergent can prevent hard water problems better than soap. Add baking soda to the mixture to make your laundry fresh and help lessen the use of artificial cleaning products. Remove leftover soap residue after the rinse cycle. DIY fabric softener also includes wool dryer balls. You don’t need to use a spray bottle, scoop, or pour anything into your load of laundry. Soak the scented oil (such as lemon essential oil) on the dryer ball for about 20 minutes to make your clothes smell fantastic. You can also use tennis balls. Make sure the oil is fully absorbed, then throw a couple of dryer balls into the dryer along with your laundry. Hair conditioner is great on the hair. It works terrific on fabrics, too. Avoid the tendency of static cling in your clothing by using this cheap softener substitute. Mix hot water and conditioner with hot water to dissolve conditioner clumps. Add an average amount in your washer during the wash cycle. A cup of vinegar is known for bacterial protection and is also great in whitening and brightening clothes. Essential oils soften fabric in your laundry. Add essential oils to vinegar. Shake well before using. Use your favorite essential oil flavors such as lavender, lemon, or peppermint. Epsom salts and baking soda work well together. This combination is brilliant to remove bad odor without harming fragile fabrics. Mix Epsom salt and essential oil together. Stir, and then add the baking soda. Pour the mixture in an empty container. You can add at least 2-3 tablespoons of this homemade laundry softener to toss with your clothes before rinsing to avoid static cling. An excellent substitute for commercial fabric softener is fabric softener crystals. To form your own crystals with a natural scent, you only need two ingredients. Mix Epsom salt and essential oil together. You can try experimenting with different scents. This recipe utilizes three popular household ingredients. The result is shocking! Pour vinegar and essential oil in a large bowl and dissolve them thoroughly. Add baking soda quickly. Get your storage container ready and transfer the mixture. Add this mixture to the dispenser in the washing machine until it reaches the fill line. Your homemade natural fabric softener will be released depending on the wash cycle you have selected. To save you money, go natural. All natural fabric softeners are proven to save the Earth and your budget. Create excellent fabric softener in 10 simple ways. Here are the primary ingredients. Even if you’re not concerned about spending money on commercial fabric softeners, consider the health and safety of your family and the environment. 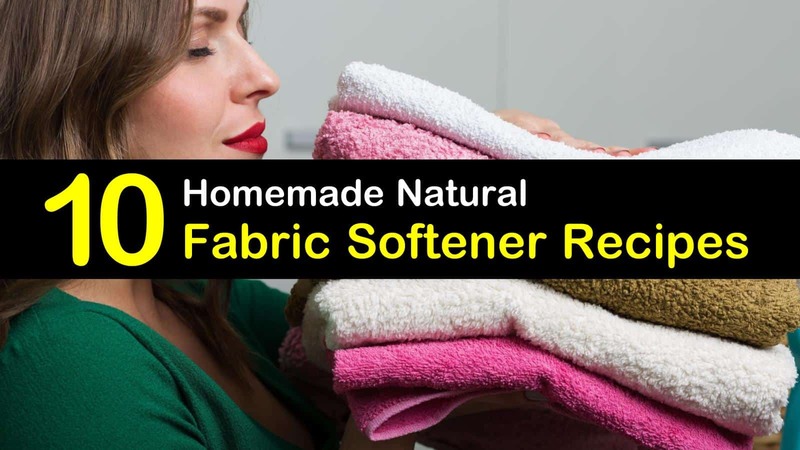 Take a little time to make your own fabric softener and enjoy the same softness without worrying about potential harm it could do to you and your clothes. In an uncertain world, you can depend on a natural fabric softener that works like magic! 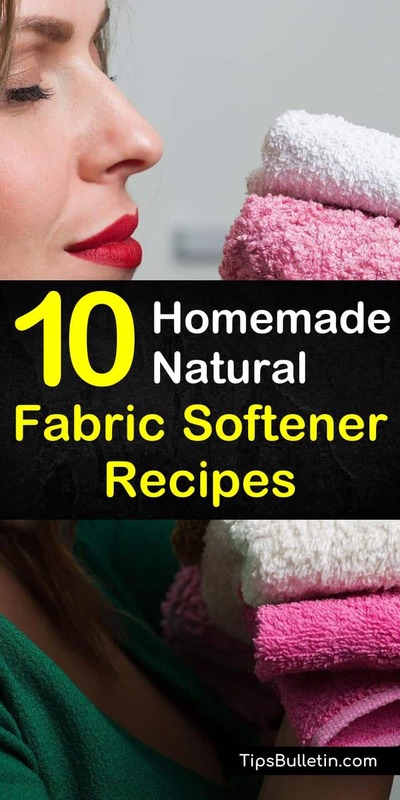 I hope you liked our content about awesome homemade fabric softener recipes. Please feel free to share these DIY fabric softener hacks with others on Pinterest, Facebook, and other social media sites.